Note We have an on-going, long term, project to establish a wildflower meadow between the trees by planting small patches of wildflowers which over the years will spread throughout the site. The soil is slightly acidic (pH 6) and so is not suitable for calcicole/chalk downland meadow flowers. 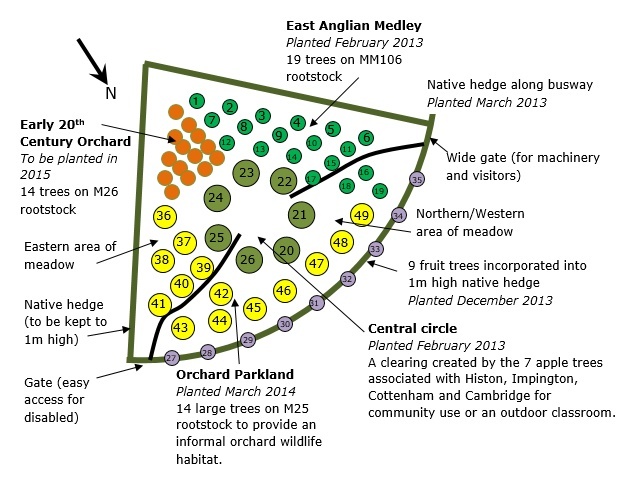 We are planting a range of meadow flowers typical of East Anglian meadows. Cut the sward to reduce strength of grass and encourage seed bank germination. Cuttings were removed when possible. Removed strips of turf from a number of squares to expose top soil. Mixed wild flower seeds sown in some squares (neutral pH soils) whilst others were left to allow monitoring of which meadow plants did well. ‘Meadow in a Tray’ project launched. Schools and individuals were invited to grow a tray of meadow flowers for planting in the meadow in Spring 2013. 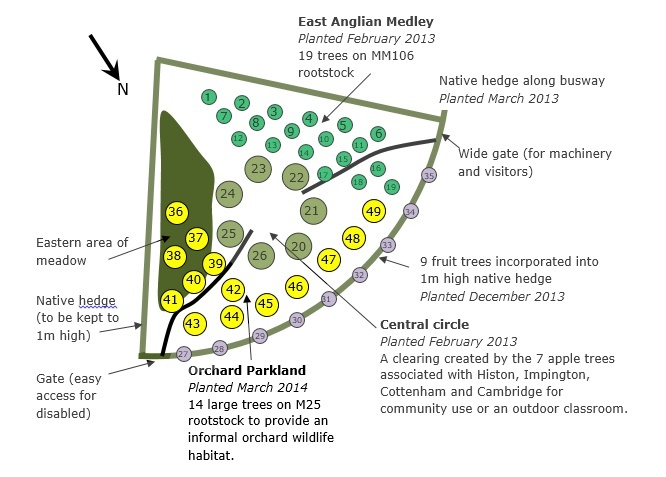 This project will continue for several years to increase the diversity of meadow plants. Planting pits were dug. Each planting pit was large enough to take the root stock. The bottom and sides of each pit were broken out to allow root growth into surrounding soil. Tree protection consisting of three poles, stock fencing and rabbit fencing was built to form triangular protection around each tree. Mesh‘openable’ to allow easy weeding around trees. After planting, the trees were well watered, and mulched. Each tree was staked and tied. Ties will be adjusted and loosened as necessary. Improving the hedge nearest the busway. Remove half the spirals on this part of the hedge in Spring 2014. Planting of the first ‘Meadows in a Tray’ on the Eastern side of the site. Trees watered during dry spells and sprayed once a fortnight with Aston Tree Wash, an organic garlic-based spray. Boundary for hedge planting planting prepared. Grass sprayed off and rotavated. Site fenced with stock control fencing to demark boundary whilst the hedge establishes. Gates erected at the corners of the arc boundary. Gates to allow access for all. Native hedge planted around the orchard site. Whips planted in double staggered rows about 45cm apart with plants about 50cm apart in each row. Whips protected with spirals, and plan to remove half of spirals in Spring 2016. 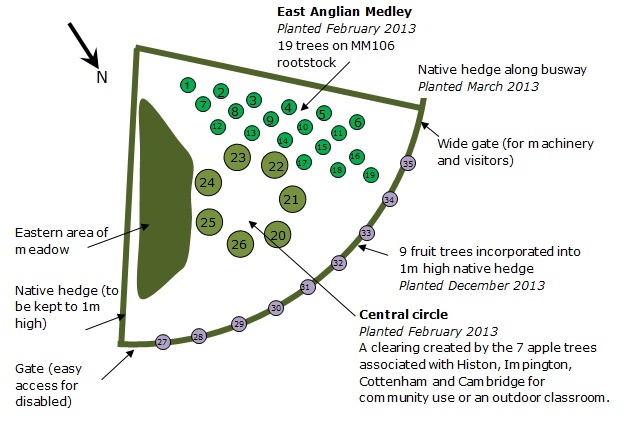 Nine fruit trees planted to grow through the hedge on the arc boundary. Second year formative pruning of the trees planted in 2013. Planting of 12 trees in the Orchard Parkland. Installing picnic tables and the Royal British Legion bench. More planting of meadow plants and mowing the grass paths through the orchard. 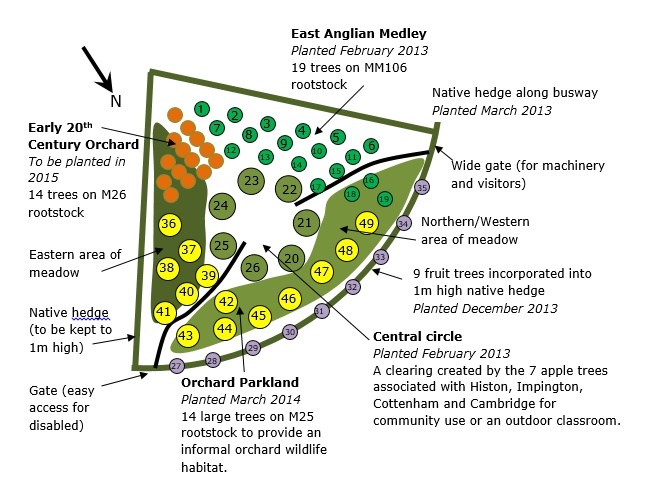 Planting of a further two trees in the Orchard Parkland and 22 trees to create the Early 20th Century Orchard. Hedge to be either cut or laid to maintain a height of 1m.